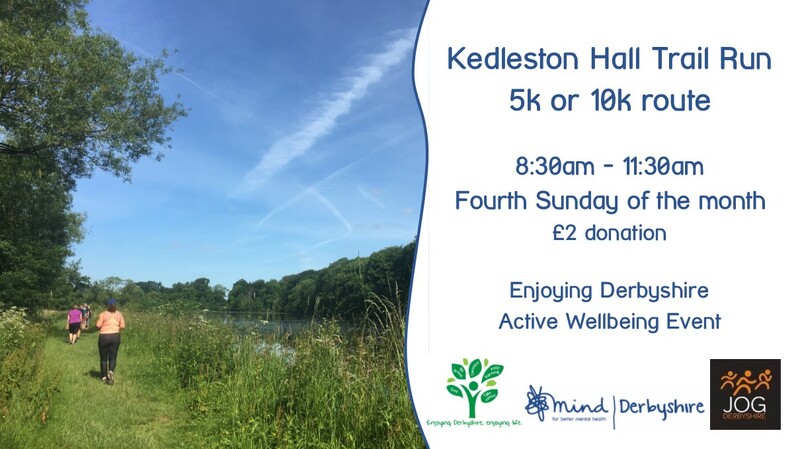 Jog Derbyshire and Kedleston Hall host a fun and friendly monthly trail run (or jog or walk) around the beautiful Kedleston Estate to raise money for Derbyshire Mind whilst promoting the benefits of outdoor exercise. For £2 entry you can sign up to do a 5K or 10K route. Registration starts opens from 8:30am and includes a group warm-up before the 10K set off first at 9:00am. The route starts off with an uphill which allows regular runners a challenge whilst enabling walkers to enjoy the scenery more! Dogs are welcome too. At the end you can collect your 20% off voucher for the café and relax with other participants. This event is run by volunteers who take registration, set up markers for the route and lead the way. If you would like to volunteer to help please contact Jog Derbyshire for more information. Please be aware that if the main entrance gates are closed, an alternate entrance to Kedleston hall is available off Mercaston Lane.